Hello fellow travellers, lovely to see you here, - this is Astrid, here to share the second leg of our Destination Inspiration journey for this month. I started with an unusual card shape, it's the width of an A4 piece long ,that's just under 30 cm or about 11/5" and 10 cm /4" high. I scored it 12 cm/ 4.75" from the left. The rest of the A4 piece of card was perfect to cut my two panels from. 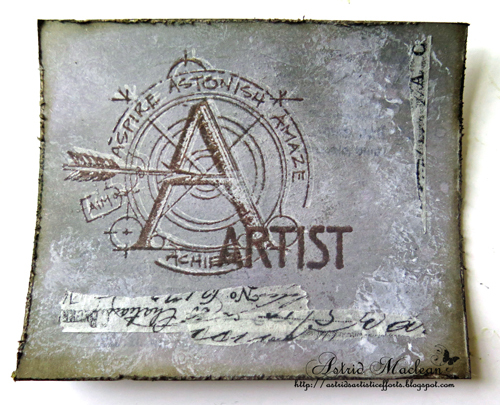 I added some texture paste through the Tim Holtz wood grain stencil and when dry covered it in places with gesso, to act as a kind of resist. Next I applied Hickory Smoke (I so LOVE that colour) all over the card with my blending tool and then used the spritz and flick technique. By now I thought that my gesso layer was a bit too stark, so I used some white chalk paint (Paper Artsy Snowflake) and a scrunched up bit of kitchen roll to blend it all together a bit, I also added some background stamping, using the same paint and stamps from the Mercantile set. A few spritzes with the Hickory Smoke Distress spray also helped to bring it all together more. 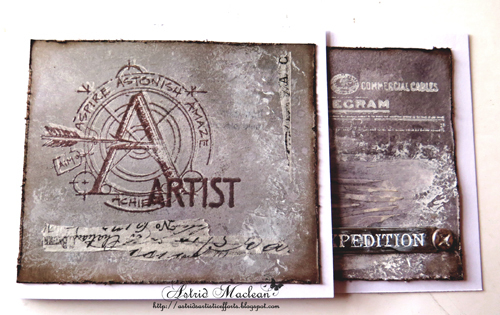 I had in mind to use this card as a gift for an artist friend and decided to give it an artist journey theme. 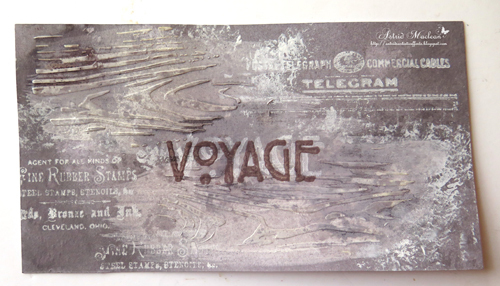 The word Voyage (from the Classics 1 set) seemed perfect. I first stamped it in white paint again and then in Memento Luxe ink and immediately embossed it with clear powder to make it stick out more. 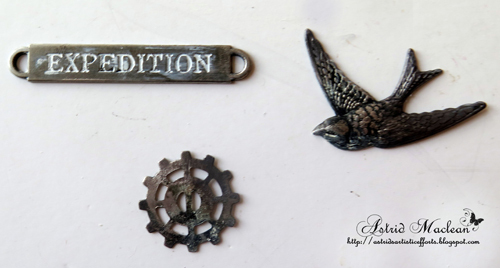 I chose these Ideaology pieces and altered them a bit with white paint, some Hickory Smoke Distress Paint and some Pewter Treasure gold. And here finally is the first part of my card complete. 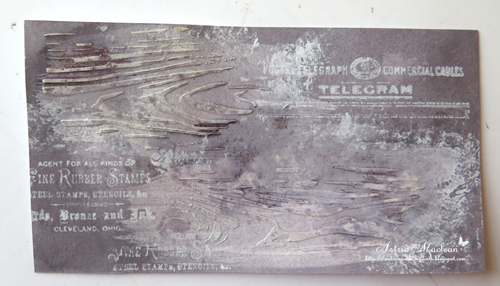 As you can probably see, I distressed the edges and inked around them with Ground Espresso Distress Ink. 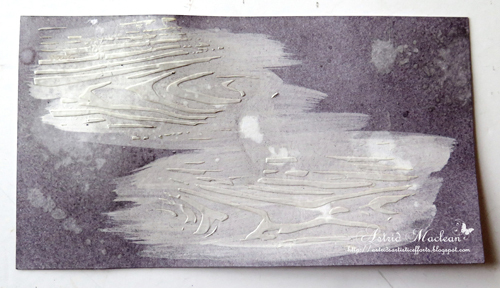 I quite like how the dabbed on white paint almost looks like sea foam on waves, this was a total lucky coincidence, but of course fits my voyage theme perfectly. Stamps used here are again from the Classics 1 and also the Classics 14 sets. 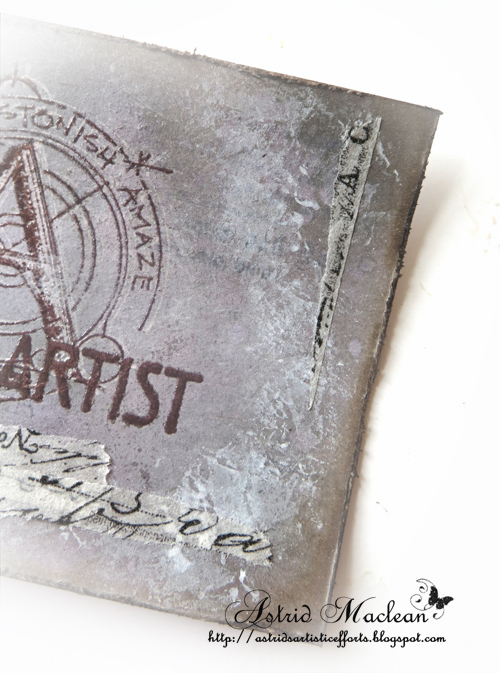 I stamped the big A first in the white paint and then with the Memento Ink, clear embossed like before; I then overstamped the word artist from the Classics 1 and again clear embossed. Instead of the metal embellishments I just used some strips of Tissue Tape. I did use the spritz and flick technique on this one also, though perhaps it is hard to see.. By the way Tim describes this technique in detail in the Compendium of Curiosities Volume 2 on page 42. Well, that's it, thank you for travelling along here for a while, hope you enjoyed it and do come back next Monday to see what the next creative guide will have prepared for you! FAntastic card Astrid. As usual you´ve just made another beauty here. For some reason you just always manage to make everything look sooo great and beautiful and this is definitely no different, I love this one. A fabulous Destination inspiration post Astrid. Your card is fantastic and you have made great use of the bag of Ingredients. What a fabulous inspiration - wonderful progress Astrid - Thank you for sharing! Beautiful! I love the cool fold too and that wood texture is fab. Fabulous! 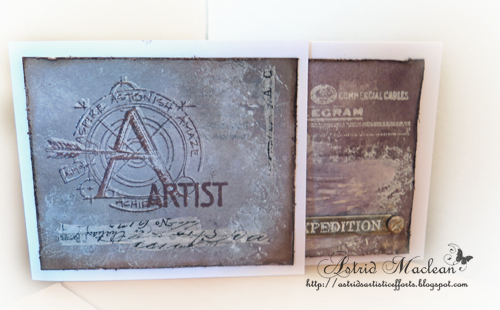 Astrid I'm a big hickory smoke fan too and love how you have used it to created the panels of your card - gorgeous colour palette, texture, imagery and design . An inspirational creation using the contents of the travel bag . 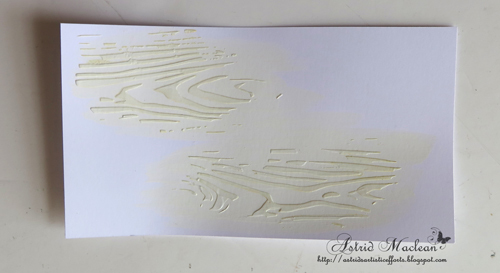 Love the shape of the card, Astrid! Oh and of course I love the card and all the details! Fabulous tutorial! Hugs and Happy Monday! 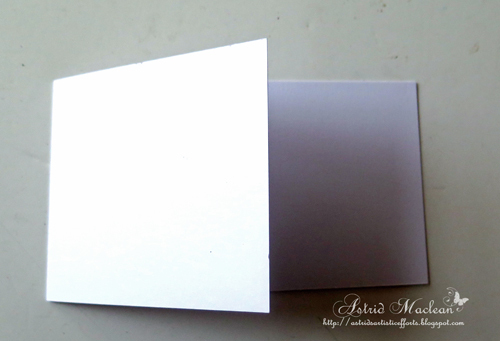 A wonderful idea with your ,to open up card , the wood grain texture looks amazing, and the front equal gorgeous. Fabulous project Astrid! 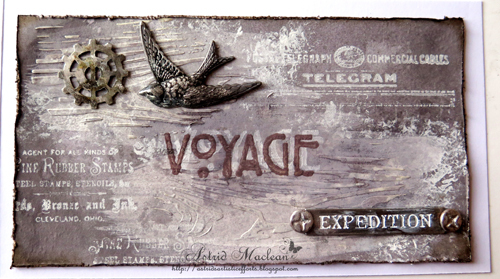 Love all the texture and metal trinkets! Thanks for the inspiration! You just can't help but love Hickory Smoke and I love how you teamed it up with Ground Expresso. Great step by step and fabulous results.